Prerequisites: Make Glass Beads or equivalent skills. This is a fun next steps glass class. 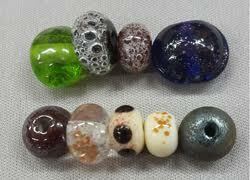 Use enamel powders, frit, and baking soda on top of glass beads to create additional effects. Learn wire-wrapping techniques using copper wire. Participants will make a very smart looking undulating bracelet with copper wire and beads. 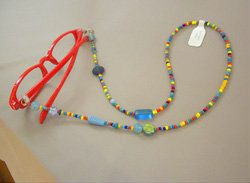 Learn how to use flexwire and crimp beads by making an eyeglass holder. The design considerations for how this is different than the strategy for a necklace will be discussed. Create your piece with seed beads and Czech pressed glass pieces. You’ll be able to make bracelets and necklaces with your new skill. 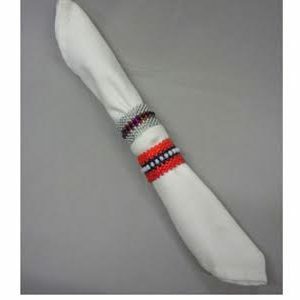 Learn the fundamentals of tubular even count peyote stitch by making a beaded napkin ring. Then make a whole set for entertaining and gifting. You will use Toho 11/0 round seed beads and Miyuki magatamas in this project. No experience necessary. www.kirkwood.edu and go to Continuing Education and then search for Beadology Iowa under the instructor search. On site registrations will be taken if registration through Kirkwood meets minimum requirements of two participants. $30 instructor fee/$28 materials fee.